10 pedestrians have been killed so far this year in Victoria, with six happening on Melbourne streets. New data from Yarra Trams shows last year two people were killed after being hit by trams, and a total of 52 pedestrians were hit. Pedestrians were also the only road user group to increase the total lives lost in a year, from 31 in 2017 to 37 last year. Of the 37 deaths last year, 32 happened in metropolitan areas with speed limits 60 kilometres per hour or lower. Both pedestrians and drivers are being urged by the Minister for Road Safety Jaala Pullford to take extra care over the school holiday period. Ms Pullford said it is expected there will be increased foot traffic and major construction projects that will bring heavy vehicles to the city. Vic Roads data shows Melbourne’s most dangerous intersection is Flinders and Swanson streets, which saw seven pedestrian crashes last year. 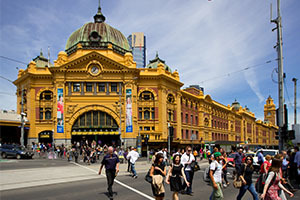 The Transport Accident Commission will be at the Melbourne Comedy Festival over easter to remind pedestrians to focus on the road and get off their phones when walking in busy metropolitan areas.